I just returned to Boston last Wednesday evening after a wonderful and relaxing three-week vacation in Minnesota with the family. After such a long trip, I knew Thursday had to be a day of playing “catch-up.” You know what that entails… the ever-exciting unpacking, cleaning, and general restoration of normalcy for the home. As I always like to have something sweet on hand for lunches, snacks, etc…the first task on my list was baking some fresh cookies for the cookie jar. However, as I was gathering ingredients for my favorite chocolate chip cookies, I quickly realized that I didn’t have any eggs…fail. After promptly adding eggs to my ever-growing grocery list, I went back to the drawing board. I knew I had butter, sugar and old-fashioned oats on hand, so I started brainstorming on what I could create with those simple ingredients. After looking through some old church cookbooks of my grandmother’s, (LOVE old cookbooks!) I decided upon this. 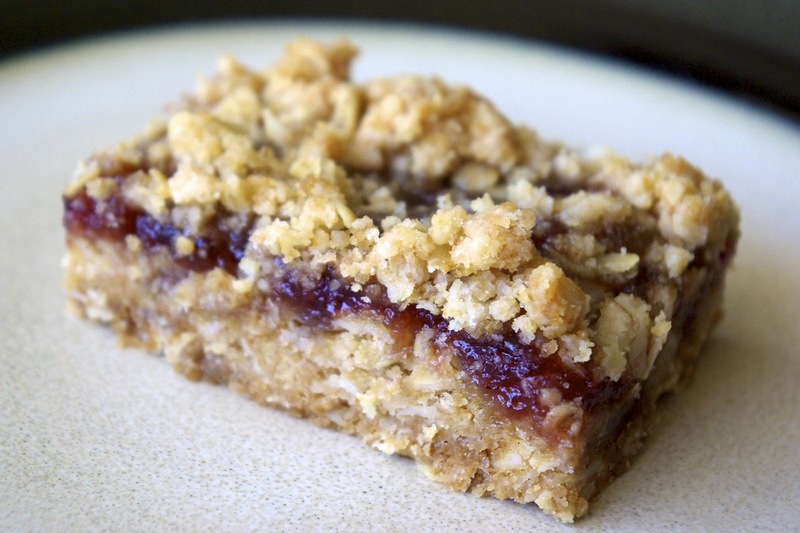 These little squares of goodness are filled with an ooey-gooey layer of strawberry jam, and topped with a crumbly, oaty, brown-sugary topping (think apple crisp) that is sure to please. Don’t let the short list of ingredients deter you; these bars pack a flavorful punch. When Ryan claimed that he was “craving them all day” after eating one at lunch, and then further declared they were his “new favorite,” I knew I had to share them with you. I hope you enjoy! in softened butter until you have a nice crumbly mixture. stir. This will make step seven MUCH easier. the remaining oat mixture over the top.